In this time of flux for the medium of photography, Photo Kathmandu has managed to decipher what may be one of the toughest dilemmas for a public event to confront: the question of viewership. The local community – the people, first of Patan and then of Kathmandu – is considered to be the primary audience, as opposed to most other photography festivals where the photography community takes precedence. Patan is a unique host for a festival like this, as it has a community that has inhabited it for centuries, and feels a sense of ownership over the space, a trait not found easily in other urban centers. Patan, where robust interactions exist within and between communities and neighborhoods, feels like a world cocooned within the frenzy of city life in the Kathmandu valley. 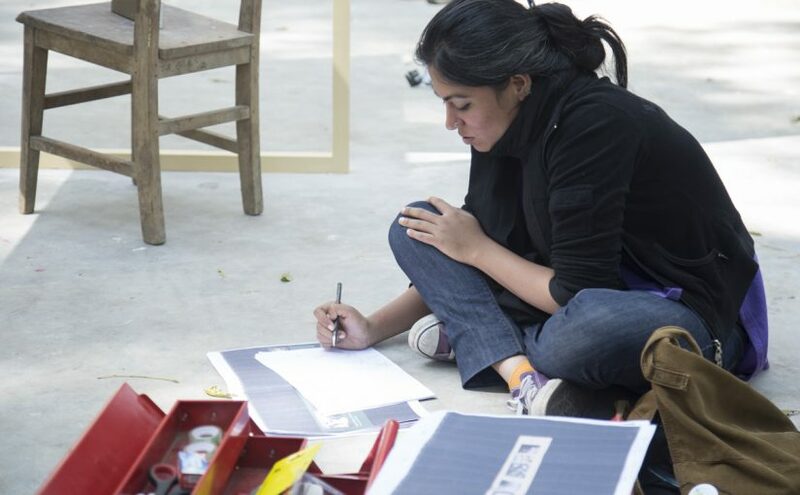 The audience question – who is the audience and how much should it impact curatorial decisions – was one that was given primary importance when NayanTara first asked me to join the festival’s team as guest curator in 2016. The festival, through its print exhibitions as well as its teaching and outreach programs, makes a concerted effort to build a connection with the local community. This is not a passive connection, but one that involves consistent interaction, encourages debate and even opens up room for dissent. For its second edition, in addition to works by Nepali photographers, or by outsiders covering Nepal, the festival was opening up to works emanating in and around South Asia. The guiding principle was to curate a selection that would be familiar enough for the audience to connect with – narratives surrounding gender and patriarchal systems, youth culture, environmental decay, for instance – while transporting them to geographically distant regions that were ideologically close enough to mirror their struggles, lived experiences or acts of resistance. I constantly question the value of images in a time when there is a deluge of visual stimulation at our disposal. The impact and outcome of displaying certain works in public spaces in Patan, confronted this question and and helped in reinstating my faith in the power of the image. Women from the courtyard Nagbahal, where Tasneem Al-Sultan’s work Saudi Tales of Love was displayed, gathered around photographs of Saudi women, almost in an act of solidarity, and critiqued the repressive Saudi regime. Teenage boys at Sandra Calligaro’s exhibition, Afghan Dream, were seen taking photographs in front of images of young people at a concert or a couple in a restaurant in Kabul. Young Nepalis were addressing their privilege of everyday freedoms, while at the same time identifying with their contemporaries in Afghanistan on other issues, such as the trials and tribulations of adolescence. If photographs can be agents of social change, then the ability of these exhibitions to catalyze conversations around identity, empathy and dissent moved us closer in that direction. The idea of creating a festival that is relevant, not just to a community of visual art connoisseurs but to a public at large, is a noble one in theory. Translating it into a functional reality requires that all decisions be filtered with this aim in mind, even if it requires the shedding of other aesthetic concerns. For Photo Kathmandu, it was important for the team that the public did not merely serve as a passive audience, but that a dialogue be initiated with people and their spaces. It was to this intent that all works were exhibited in public spaces—in the hiti or community step-well, in the hall typically used to host the community feast or bhoe, in bahas or courtyards that are central to Newar culture. These venues opened up novel possibilities of collaboration with the site itself, such as in the installation of Ian Teh’s work The Vanishing-Altered Landscape and Displaced Lives on the Yangztse River at Saugalhiti, one of the many step-wells with a traditional water supply system that still cater to the neighboring population of Patan. Teh’s work addresses the submergence of landscapes, and therefore of livelihoods, engendered by the construction of the Three Gorges Dam on the Yangtze river; displayed in the hiti, it opened up unique conversations, especially when locals came to collect their day’s water supply. This decision to actively engage with the audience by taking photography to their space and asking them to take ownership of it created a new interactive relationship allowing the festival to address the issue of inaccessibility which often plagues many of the contemporary white cube gallery spaces and exhibition practices. A personal favorite from the festival was the evening when there was a bhoé, or feast, organized to fundraise for the Bungamati Museum, which was razed to the ground during the 2015 earthquake. A public slideshow was organized at the rubble-filled site where the majestic temple once stood. It showcased images from family archives of Bungamati playing to the tunes of Kutumba, a popular local folk ensemble. Following that, a local community organization, the Maharjan Samaj, cooked and served us a traditional Newari feast, while we congregated in rows on the floor, cherishing the food and the friendships. For me, that evening embodied the ethos of the festival – the building of human connections, the emphasis on communities, and the genuine effort to generate meaningful interactions. That day, sitting amongst practitioners from across the world, I felt that we were not just a community of photographers, but what felt like brothers and sisters who broke bread together.